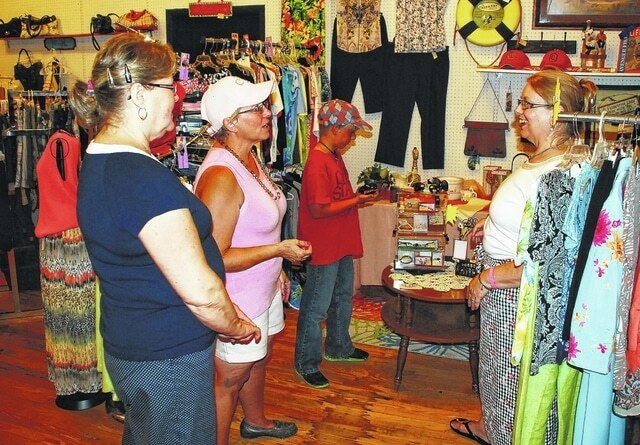 Unique Boutiques owner Cyndi Sue Dibert speaks with two vendors inside her downtown Urbana business on Thursday. Pictured, left to right, are Belinda Carter, Dibert, TJ Todd (Dibert’s grandson) and Peggy Harper. For the second time since opening her downtown Urbana business 20 years ago, Cyndi Sue Dibert has reinvented her store at 112 N. Main St. in hopes of keeping pace with the ever-changing marketplace. In 1995, Dibert made her debut in Monument Square when she opened Absolute Floral. Fifteen years later in September 2010, the business underwent its first change when Absolute Floral and Unique Boutiques opened following Dibert’s decision to transform the majority of her store’s square footage into an upscale resale shop in light of a trend in the floral business toward more online sales. Last July, however, Dibert officially said goodbye to her floral business and the Absolute Floral name, turning her attention to the remaining half of her business – Unique Boutiques. Open from 11 a.m. to 6 p.m. Tuesday through Friday and from 11 a.m. to 5 p.m. on Saturday, Unique Boutiques offers downtown shoppers a variety of products, including tux rentals, clothing, jewelry, handmade and re-purposed items, antiques, collectibles, garden décor and interior design items. Unique Boutiques currently features 24 vendors with space still available for rent by calling the shop at 937-652-2800. Over the past five years, Dibert has helped several vendors grow their businesses to the point where they now have their own storefronts. “A lot of the existing downtown proprietors got their start here and then ventured out once they were established,” she said. Having taken part in two recent mission trips to Peru and Haiti, Dibert is working closely with nonprofit organizations in hopes of improving the lives of not only local people, but also individuals living in third world countries. The plan, Dibert said, is to reserve space for organizations to set up booths free of charge to allow for the profits generated through sales at the booths to be used toward mission work here and abroad. Belinda Carter, who not only rents space in Unique Boutiques but also helps Dibert with the day-to-day operations, said the business is focusing on creating various events throughout the year to attract foot traffic to the downtown businesses. One such event, a sidewalk sale, has been planned for Saturday, June 27. While Unique Boutiques is the only store confirmed to be taking part in the event, Dibert is hopeful other Monument Square establishments will participate as well. “We are encouraging other downtown businesses to join in with their own sidewalk sales,” she said.